A wedding viewing day will be held on Sunday 21 March from 11am – 4pm to showcase Hengrave Hall in all its wedding glory. Dreamwave Events will be there along with other recommended suppliers to chat with you and to answer any questions about planning your wedding at Hengrave Hall. No appointment is necessary and entry is fee. For more information please contact Hannah at Hengrave Hall on 01284 768024. 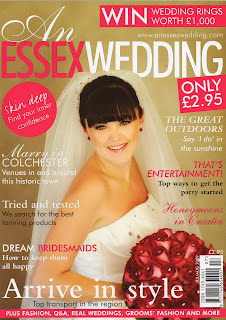 Sunday 28th February 2010 is The Suffolk Wedding Show at its new localtion Wherstead Park. 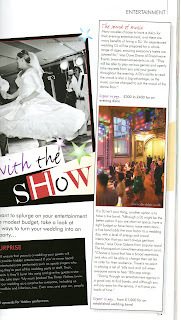 You can find us exhibiting our wedding DJ and Disco services there. The fair is open between 11.00am and 3.30pm and is packed with all the suppliers you need for your big day. Saturday 11th July was our first visit to Smeetham Hall Barn, Sudbury. 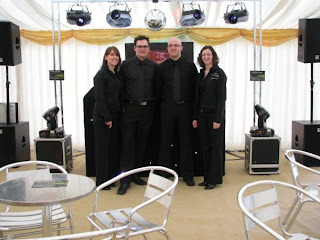 We provided our complete wedding DJ & disco service for the new Mr & Mrs Foot. This amaizng and stunning 16th century barn is owned by the Hyde Parker’s. 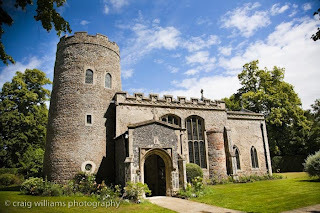 Bridget and her team run a very professional and friendly wedding venue in an idyllic setting. Our clients also booked our optional up-lighters to enhance their wedding colours and ‘pink’ theme. Throughout the wedding breakfast the top table was back-lit with four LED up-lighters, these were then moved to the dance floor area, to complement the ‘disco lighting’ ready for the evening party. A great evening was had by all, many comments were made from guests on how good the music selection was and the ‘mixing skills’ of the DJ. I would like to wish the new Mr & Mrs Foot all the best for the future as husband and wife. 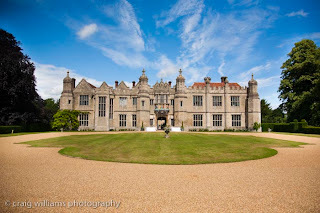 Hengrave Hall is an exquisite and enchanting Tudor mansion flowing with English history. Situated in Hengrave, Bury St. Edmunds with almost fifty acres of sweeping lawns and meadow, this fully restored venue is now open for weddings, conferences, corporate & special events. Dreamwave Events are proud to announce we are the exclusive providers of DJ & Disco entertainment at Hengrave Hall, working closely with this amazing venue we have been able to tailor our services to suit the period setting and features within the rooms. More information about what services we can provide can be found on our dedicated venue page. Click here. Hengrave Hall opened their doors for the first time Sunday 5th July, the wedding open day was a great success. We were also pleased to provide our cocktail DJ service along with demonstrations of an evening disco in the Banqueting Hall at the official champagne launch party in late June. For more information on this amazing one of a kind venue. click to there website….